Even though experiments – whether demonstrated to, or personally performed by students – have been part of training in STEM for a long time, their effectiveness as an educational tool are sometimes questioned. For, despite students’ ability to produce correct answers to standard questions regarding these laboratory exercises, probing deeper often reveals a lack of conceptual understanding. One way to help students make sense of experiments is to use them in combination with an elicit-confront-resolve approach. With this approach, before the experiment demonstrating a specific concept is run, students are asked to discuss the expected outcome in groups. In so doing, should (specific) misconceptions be harbored about the underlying concept, these are elicited. Incorrect student feedback (feedback illustrating that a misconception is present) is not corrected at this stage. As the demonstration plays out, a mismatch between observation and hypothesis confronts students with their misconceptions. Finally, repetition of the experiment and peer discussion as well as discussion with the instructor lead to resolving of the misunderstandings. Here, we apply the elicit-confront-resolve approach to a standard demonstration in introductory dynamics, namely the interplay of a rotating frame of reference, movement of particles observed from outside that frame of reference and the resulting fictitious forces. The efficacy of the elicit-confront-resolve approach for this purpose is discussed. Additionally, recommendations are given on how to modify instruction to further aid students in interpreting and understanding their observations. In many STEM disciplines, demonstrations and hands-on experimentation have been part of the curriculum for a long time. However, whether students actually learn from watching demonstrations and conducting lab experiments, and how their learning can be best supported by the instructor, is under dispute (Hart et al, 2000). There are many reasons why students might fail to learn from demonstrations (Roth et al, 1997). For example, separating the signal to be observed from the inevitable noise can be difficult, and inference from other demonstrations might hinder interpretation of a specific experiment. Sometimes students even “remember” witnessing outcomes of experiments that were not there (Milner-Bolotin, Kotlicki, and Rieger (2007)). Even if students’ and instructors’ observations were the same, this does not guarantee congruent conceptual understanding and conceptual dissimilarity may persist unless specifically treated. However, helping students overcome deeply rooted notions is not simply a matter of telling them which mistakes to avoid. Often they are unaware of the discrepancy between the instructors’ words and their own thoughts (Milner-Bolotin, Kotlicki, and Rieger (2007)). One way to address misconceptions is by using an elicit-confront-resolve approach (McDermott, 1991). Posner et al. (1982) suggested that dissatisfaction with existing conceptions, which in this method is purposefully created in the confront-step, is necessary for students to make major changes in their concepts. As shown by Kornell (2009), this approach enhances learning by confronting the student with their lack of an answer to a posed question. Similarly, Muller et al. (2007) find that learning from watching science videos is improved if those videos present and discuss common misconceptions, rather than just presenting material textbook-style. In this article we look at how an elicit-confront-resolve approach can further student engagement and learning. This is done by using a typical introductory demonstration in geophysical fluid dynamics, namely the effect of rotation on the movement of a ball as seen from within and from outside the rotating system. 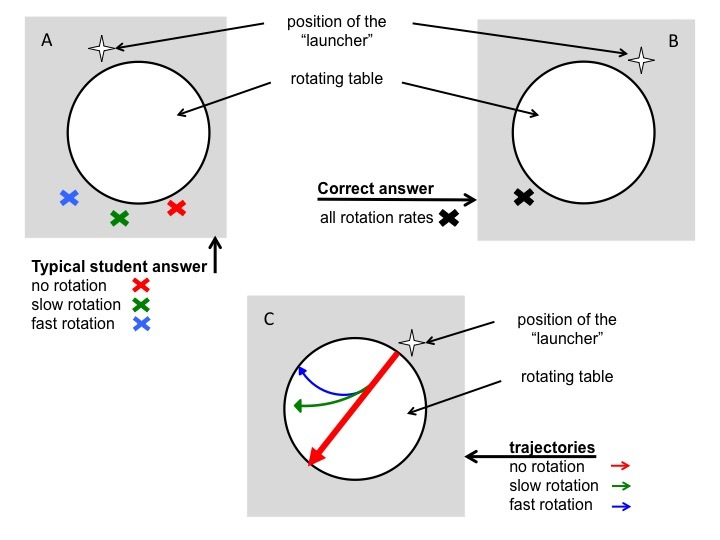 The motivation for the choice of experiment is dual: the rising popularity of rotating tables in undergraduate oceanography instruction (Mackin et al, 2012), and the difficulties students display in anticipating the movement of an object on a rotating body when they themselves are not part of the rotating system. On a rotating earth, all large-scale motion is subject to the influence of the fictitious Coriolis force, and without a solid understanding of the Coriolis force it is impossible to understand the movement of ocean currents or weather systems. Furthermore, the Coriolis force forms an important part of classical oceanographic theories, such as the Ekman spiral, inertial oscillations, topographic steering and geostrophic currents. A thorough understanding of the concept of fictitious forces and observations in rotating vs. non-rotating systems is thus essential in order to gain a deeper understanding of these systems. Therefore, most introductory books on oceanography, or more generally geophysical fluid dynamics, present the concept in some form or other (cf. e.g. Cushman-Roisin (1994), Gill (1982), Pinet (2009), Pond and Pickard (1983), Talley et al. (2001), Tomczak and Godfrey (2003), Trujillo and Thurman (2013)). Yet, temporal and spatial frames of reference have been described as thresholds to student understanding (Baillie et al., 2012). The frame of reference is the chosen set of coordinate axes relative to which the position and movement of an object is described. The choice of axes is arbitrary and usually made such as to simplify the descriptive equations of the object under regard. Any object can thus be described in relation to different frames of reference. When describing objects moving on the rotating Earth, the most commonly used frame of reference would be fixed on the Earth (co-rotating), so that the motion of the object is described relative to the rotating Earth. Alternatively, the motion of the same object could be described in an inert frame of reference outside of the rotating Earth. Even though the movement of the object is independent of the frame of reference used to describe it, this independence is not immediately apparent. Objects moving on the rotating Earth seemingly experience a deflecting force when viewed from the co-rotating reference frame. Comparison of the expressions for the movement of a body on the rotating Earth in the inert versus rotating coordinate systems, shows that the rotating reference frame requires additional terms to correctly describe the motion. One of these terms, introduced to convert the equations of motion between the inert and rotating frames, is the so-called Coriolis term (Coriolis, 1835). Ever since its first mathematical description in 1835 (Coriolis, 1835) this concept is most often taught as a matter of coordinate transformation, rather than focusing on its physical relevance (Persson, 1998). 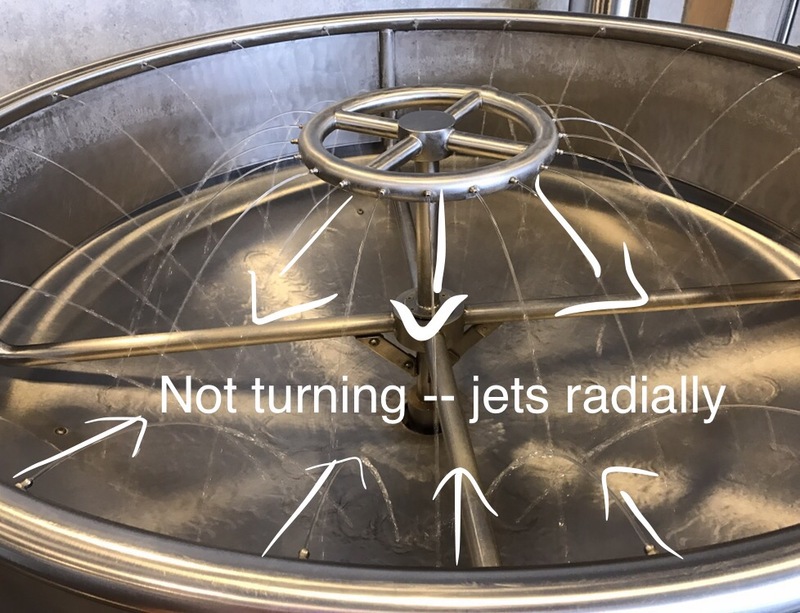 Students are furthermore taught that the Coriolis force is a “fictitious” force, resulting from the rotation of a system and that its influence is not visible when observed from outside the rotating frame of reference. It is therefore often perceived as “a ‘mysterious’ force resulting from a series of ‘formal manipulations’” (Persson, 2010). In many oceanography programs, the difficult task of helping students gain a deeper understanding of these systems is approached by presenting demonstrations, either in the form of videos or simulations (e.g. 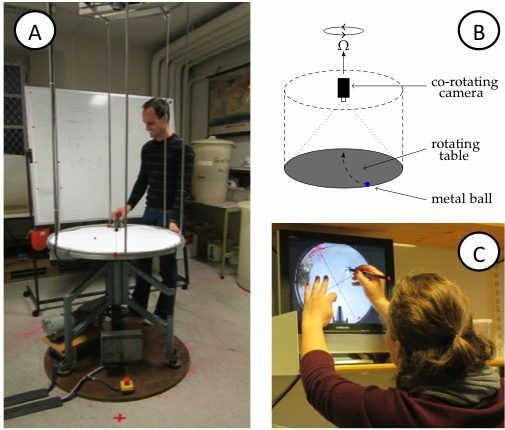 a ball being thrown on a merry-go-round, showing the movement both from a rotating and a non-rotating frame, Urbano & Houghton (2006)), or in the lab as demonstration, or as a hands-on experiment. 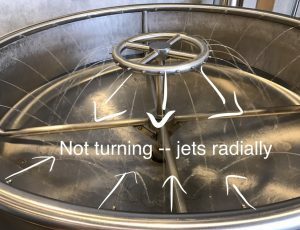 While helpful in visualizing an otherwise abstract phenomenon, using a common rotating table introduces difficulties when comparing the observed motion to the motion on Earth. This is, among other factors, due to the table’s flat surface (Durran and Domonkos, 1996), the alignment of the (also fictitious) centrifugal force with the direction of movement of the ball (Persson, 2010), and the fact that a component of axial rotation is introduced to the moving object when launched. Hence, the Coriolis force is not isolated. 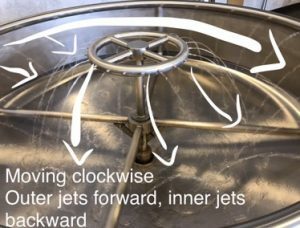 Regardless of the drawbacks associated with the use of a (flat) rotating table to illustrate the Coriolis effect, we see value in using it to make the concept of fictitious forces more intuitive, and it is widely used to this effect. During conventional instruction, students are exposed to simulations and after instruction, students are able to calculate the influence of the Coriolis term. 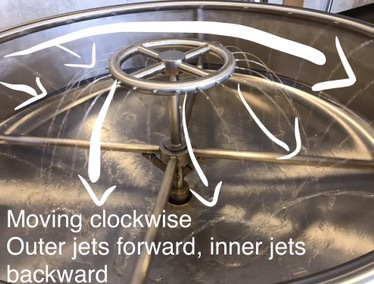 Nevertheless, they have difficulty in anticipating the movement of an object on a rotating body when confronted with a real-life situation where they themselves are not part of the rotating system. When asked, students report that they are anticipating a deflection depending on the rotation direction and rate. Contextually triggered, these knowledge elements are invalidly applied to seemingly similar circumstances and lead to incorrect conclusions. Similar problems have been described for example in engineering education (Newcomer, 2010). The authors noticed in 2011 that most students participating in that year’s lab course, despite having participated in performing the experiment, still harbored misconceptions. Despite having taken part in performing the demonstration, misunderstanding remained as to what forces were acting on the ball and what the movement of the ball looked like in the different frames of reference. This led to the authors adopting the elicit-confront-resolve approach for instruction, as described above, in 2012. We initially considered starting the lab session on the Coriolis force by throwing the ball diametrically across the rotating table. Students would then see on-screen the curved trajectory of a ball, which had never made physical contact with the table rotating beneath it. It was thought that initially considering the motion from the co-rotating camera’s view, and seeing it displayed as a curved trajectory when direct observation had shown it to be linear, might hasten the realization that it is the frame of reference that is to blame for the ball’s curved trajectory. However the speed of the ball makes it very difficult to observe its curved path on the screen in real time. Replaying the footage in slow motion helps in this regard. Yet, removing direct observation through recording and playback seemingly hampers acceptance of the occurrence as “real”. 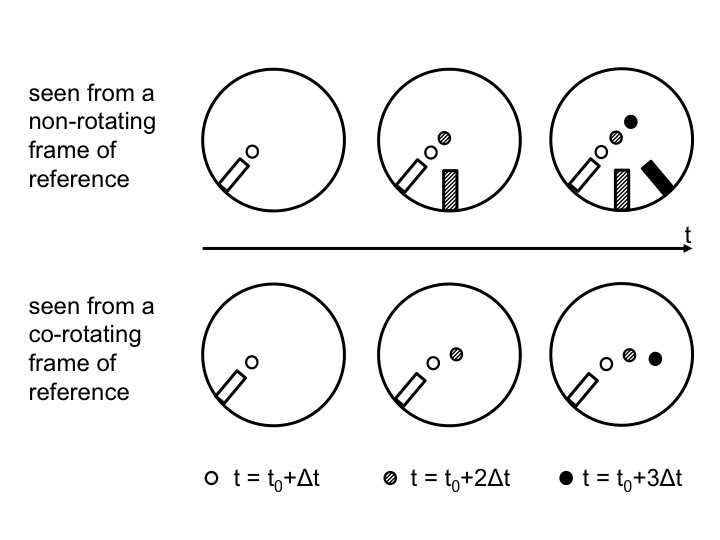 It was therefore decided that this method only be used to further illustrate the concept once students were familiar with the general (or standard) experimental setup. In 2012, 7 groups of 5 students each conducted this experiment under the guidance of both authors together. The authors gained the impression that the new strategy of instruction enhanced the students’ understanding. In order to test this impression and the learning gain resulting from the experiment with the new methodology, in 2013 identical work sheets were administered before and after the experiment. These work sheets were developed by the authors as instructional materials to make sure that every student individually went through the elicit-confront-resolve process even when, with future cohorts, this experiment might be run by other instructors (who might not be as familiar with the elicit-confront-resolve method) and with larger student groups (where individual conversations with every student might be less feasible for the instructor). However, it turned out to be useful for quantifying what we had previously only qualitatively noticed: That a large part of the student population did indeed expect to see a deflection despite observing from an inert frame of reference. In total, 8 students took the course in 2013, and all agreed to let us talk about their learning process in the context of this article. One of those students did not check the before/after box on the work sheet. We therefore cannot distinguish the work done before and after the experiment, and will disregard this student’s responses in the following discussion. This student however answered correctly on one of the tests and incorrectly on the other. In the first question, students were instructed to consider both a stationary table and a table rotating at two different rates. They were then asked to, for each of the scenarios, mark with an X the location where they thought the ball would contact the floor after dropping off the table’s surface. In the work sheet done before instruction, all 7 students predicted that the ball would hit the floor in different spots – diametrically across from the launch point for no rotation, and at increasing distances from that first point with increasing rotation rates of the table (Figure 3). This is the same misconception we noticed in earlier years and which we aimed to elicit with this question: students were applying correct knowledge (“In the Northern Hemisphere a moving body will be deflected to the right”) to situations where this knowledge was not applicable (when observing the rotating body and the moving particle upon it from an inert frame of reference). Figure 3A: Depiction of the typical wrong answer to the question where a ball would land on a floor after rolling across a table rotating at different rotation rates. B: Correct answer to question in (A). C: Correct trajectories of balls rolling across a rotating table. In a second question, students were asked to imagine the ball leaving a dye mark on the table as it rolls across it, and to draw these traces left on the table. In this second question students were thus required to infer that this would be analogous to regarding the motion of the ball as observed from the co-rotating frame of reference. Five students drew them correctly and consistently with the direction of rotation they assumed in the first questions, while the remaining two did not attempt to answer this question. After the experiment had been run repeatedly and discussed until the students signaled no further need for re-runs or discussion, the students were asked to redo the work sheet. This resulted in 6 students answering both questions correctly. The remaining student answered the second question correctly, but repeated the same incorrect answer to the first question that they gave in their earlier worksheet. Seeing as the students had extensively discussed and participated in the experiment immediately prior to doing the work sheet for the second time, it is maybe not surprising that the majority answered the questions correctly during the second iteration. In this regard it is important to note that our teaching approach was not planned as a scientific study, but rather developed naturally over the course of instruction. Had we set out to determine the longer-term impact of its efficacy, or its success in abetting conceptual understanding, we should ideally have tested the concept in a new context. As a teaching practice this is advisable. However, the students’ laboratory reports supply additional support of the claimed usefulness of our new approach. These reports had to be submitted within seven days of originally doing the experiment and accompanying work sheets. One of the questions in their laboratory manual explicitly addresses observing the motion from an inert frame of reference as well as the influence of the table’s rotational period on such motion. This question was answered correctly by all 8 students. This is remarkable for two reasons: firstly, because in the previous year without the elicit-confront-resolve instruction, this question was answered incorrectly by the vast majority of students; and secondly, because for this specific cohort, it is one of the few questions that all students answered correctly in their laboratory reports. Seven students most certainly make for an insufficient sample size to claim these results have any statistical significance, and this discussion only scratches the surface of what and how students understand frames of reference. However, there is preliminary indication that a) students do indeed harbor the misconception we suspected, and b) that an elicit-confront-resolve approach helped resolve the misunderstanding. In the suggested instructional strategy, students are required to explicitly state their expectations about what the outcome of an experiment will be, even though their presuppositions are likely to be wrong. The verbalizing of their assumptions aids in making them aware of what they implicitly hold to be true. This is a prerequisite for further discussion and enables confrontation and resolution of potential misconceptions. This elicit-confront-resolve approach has implications beyond instruction on the Coriolis force or frames of reference. Being able to correctly calculate solutions to textbook problems does not necessarily imply a correct understanding of a concept. Generally speaking, when investigating the roots of student misconceptions, the problem is often located elsewhere than initially suspected. The instructor’s awareness hereof goes a long way towards better understanding and better supporting students’ learning. We would also like to point out that gaining (the required) insight from a seemingly simple experiment, such as the one discussed in this paper, might not be nearly as straightforward or obvious for the students as anticipated by the instructor. Again, probing for conceptual understanding rather than the ability to calculate a correct answer proved critical in understanding where the difficulties stemmed from, and only a detailed discussion with several students could reveal the scope of difficulties. We would encourage every instructor not to take at face value the level of difficulty your predecessors claim an experiment to have! The authors are grateful for the students’ consent to present their worksheet responses in this article. Coriolis, G. G. 1835. Sur les équations du mouvement relatif des systèmes de corps. J. de l’Ecole royale polytechnique 15: 144–154. Cushman-Roisin, B. 1994. Introduction to Geophysical Fluid DynamicsPrentice-Hall. Englewood Cliffs, NJ, 7632. Gill, A. E. 1982. Atmosphere-ocean dynamics (Vol. 30). Academic Pr. Milner-Bolotin, M., Kotlicki A., Rieger G. 2007. Can students learn from lecture demonstrations? The role and place of Interactive Lecture Experiments in large introductory science courses. The Journal of College Science Teaching, Jan-Feb, p.45-49. Pinet, P. R. 2009. Invitation to oceanography. Jones & Bartlett Learning. Pond, S. and G. L. Pickard 1983. Introductory dynamical oceanography. Gulf Professional Publishing. Talley, L. D., G. L. Pickard, W. J. Emery and J. H. Swift 2011. Descriptive physical oceanography: An introduction. Academic Press. Tomczak, M., and Godfrey, J. S. 2003. Regional oceanography: an introduction. Daya Books. P.S. : This text originally appeared on my website as a page. Due to upcoming restructuring of this website, I am reposting it as a blog post. This is the original version last modified on January 24th, 2017. This entry was posted in demonstration (easy), hands-on activity (easy), method and tagged Coriolis, Coriolis deflection, Coriolis force on August 3, 2018 by mglessmer. Why do we go to all the hassle of rotating our swimming pool? 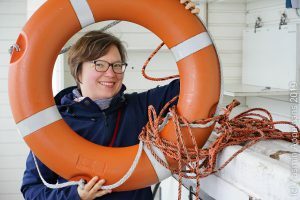 This blog post was written for Elin Darelius & team’s blog (link) which you should totally follow if you aren’t already! 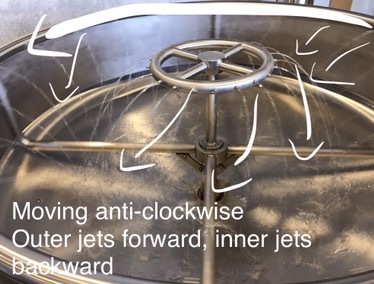 We have started rotating and filling water into our 13-meter-diameter rotating tank! So exciting! Pictures of that to come very soon. But first things first: Why do we go to the trouble of rotating the swimming pool? The Earth’s rotation is the reason why movement that should just go straight forward (as we learned in physics class) sometimes seems to be deflected to the side. For example, trade winds should be going directly towards the equator from both north and south, since they are driven by hot air rising at the equator, which they are replacing. Yet we see that they blow towards the west in addition to equatorward. And that is because the Earth is rotating: So even though the air itself is only moving towards the equator, when observed from the Earth, the winds seem to be deflected by what is called the Coriolis force. The influence of the Coriolis force becomes visible when you look at weather systems, which also swirl, rather than air flowing straight to the center where it then raises. Or when you look at tidal waves that propagate along a coastline rather than just spreading out in all directions. Or when you look at ocean currents. But all of these effects are fairly large-scale and not so easy to observe directly by just looking up in the sky or out on the ocean for a short while. This entry was posted in Reblogged from E. Darelius & Team and tagged Coriolis, Coriolis deflection, Coriolis force, Coriolis platform, EDarelius&team, LEGI Grenoble, rotation on September 11, 2017 by mglessmer.